Santi Cazorla was the author of a late surprise in the Santiago Bernabéu last night, equalizing the game to 1-1 and stopping Real Madrid's 11-games winning streak in La Liga. Benzema scored before the break, but Cazorla gave Malaga a reason to celebrate late in the 2nd half, in a game where Pelegrini's side dominated the ball possession. 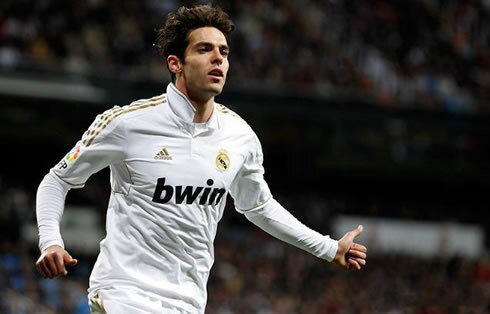 Real Madrid were surprisingly held to a 1-1 draw this Sunday night, as they hosted Malaga in the Santiago Bernabéu. Cristiano Ronaldo assisted Karim Benzema brilliantly for the opener close to the 35th minute of the 1st half, but Santi Cazorla, who probably deserves the man of the match award, equalized after scoring from an impressive free-kick with already 1 minute played in the 2nd half added time. 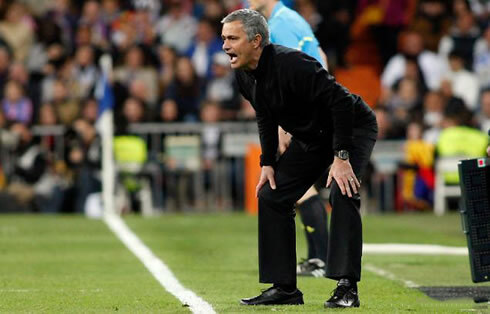 With 11 games left in La Liga, the Merengues saw their lead to Barcelona being cut to 8 points and there's a dangerous visit to the "El Madrigal" this next Wednesday waiting for José Mourinho's men, in a promising clash with Villarreal. Real Madrid conceded their second draw of this La Liga season and they have no one else to blame but themselves. Malaga visited Madrid without complexes, outplayed the Merengues on midfield and truth has to be said that they got rewarded with a deserving point near the end of the match. Surprisingly, Manuel Pellegrini's side had a total of 53% ball possession and even though they've only reached their goal in the 2nd half added time, there were several good chances for that to happen throughout the game, as well as there were big opportunities for Real Madrid to extend the lead. In a similar way to what has happened in a recent past, Real Madrid failed to start the game with the right foot and allowed Malaga to control the tempo of the game with good passing combinations. Pellegrini's side showed that they aren't ranked 4th in La Liga just by chance and players such as Cazorla, Joaquín and Isco all had great performances. Despite the better start from Malaga, it was Real Madrid who found a way to score the first goal of the night. Cristiano Ronaldo received a pass from Kaká on the left wing, decided to run a few meters with the ball close to his feet, just before cutting inside and making a sudden cross with his right foot. That pass came out being a world-class assist to Karim Benzema, who just had to head the ball to an empty net, easily beating Malaga's goalkeeper, Willy Caballero. Malaga had been the better side in the first half, but a clinical Real Madrid allowed José Mourinho's men to go into half-time with a 1 goal advantage. The Portuguese coach probably realized there was an urgent need of a big improvement after the break, but unlike many other games this season, the Merengues found it hard to contradict Malaga's dominance on midfield and ended showing visible signs of frustrations in several moments of the game. Nevertheless, it also has to be said that Real Madrid slightly improved their performance levels in the 2nd half, as they changed their game approach and started to create more danger from counter-attacks. Cristiano Ronaldo and Benzema were very close to extend the lead in a few occasions, but some of those were superbly denied by Caballero, while others were simply wasted by bad decisions. There's an old saying in football about a team not scoring from their chances and ending up conceding a goal afterwards. Unfortunately, it proved to be right this Sunday night at the Santiago Bernabéu and the late upset arrived precisely in added time, with already 91 minutes on the clock. Granero fouled a Malaga player near Real Madrid's penalty area, in a period where the Merengues were already feeling the pressure of holding this 1 goal advantage at home. Malaga's most technically gifted played, Santiago Cazorla, was put in charge of taking the free-kick and pulled off a top notch free-kick that simply froze the Santiago Bernabéu. The final score was set to 1-1 and Real Madrid dropped 2 points from their lead over Barcelona, which now makes it a 8 points gap now. 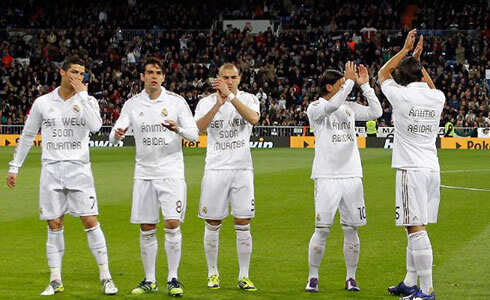 Real Madrid next game is for La Liga against Villarreal, this next Wednesday (21-03-2012). In the meanwhile you can watch Benfica vs Porto, Barcelona vs Granada, Juventus vs Milan and QPR vs Liverpool, all from our soccer live streams section. Cristiano Ronaldo is expected to be on the line-up when Real Madrid visits Villarreal this next Wednesday.